At least one person was feared dead yesterday while over 22 others sustained various degrees of injury when masquerades in their numbers invaded the Holy Ghost Adoration Ministry, Uke, Idemili North Local Government Area of Anambra State. 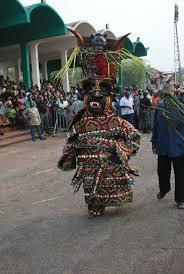 The masquerades in anambra, which were said to be celebrating a festival known as Uzo Iyi, invaded the worship ground, beating up members and also attempting to whisk away the spiritual director of the centre, Rev Fr Emmanuel Obimma. Owojela’s Blog gathered that three of the masquerade members were arrested by operatives of SARS upon complaint from the church that they were extorting worshippers coming to the church. Owojela’s Blog gathered that the leadership of the church called in the SARS operatives to help their internal security to protect worshipers, but upon arriving, the operatives arrested three masquerades who were involved in the extortion, but their colleagues attempted to stop them from taking the arrested masquerades away, prompting SARS operatives to shoot sporadically into the air before whisking the masquarades away. Personal Assistant to Fr Obimma, Mr. Francis Okoye, who spoke to journalists, said a priest, Rev Father Henry Nnajiofor, a seminarian and 28 others were injured during the attack on the worshippers. It was however gathered from some worshipers that an unidentified person was feared dead during a stampede caused by the attack. “As at 8:30 pm, we started receiving information that group of masquerades were attacking our members, inflicting bodily injuries on them as a result of severe flogging. They flogged some of them, stabbed some with their weapons including machete, while others were robbed of their mobile phones and other valuables. “We quickly contacted the SARS office to assist our Adoration security that could not handle the situation at that point in time. When SARS arrived in an hour later, they arrested two masquerades but on their way back, the youths blocked the road and insisted that the masquerades must be released. 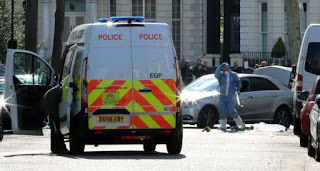 That was when SARS officials fired shots on the air to disperse them. “When SARS left, they regrouped again and this time came in their numbers to the Adoration premises, beating everybody including the elderly, the sick and pregnant women. Our Adoration youths, in defence, pursued them and arrested one other masquerade who stayed in the Adoration ground with us until this morning when we handed him over the official of the Nigerian Army that came for our rescue,” he narrated. Owojela’s Blog learnt that worshipers had to form human shield to protect Father Obimma, who was said to be the main target of the attack.